Featuring two restaurants and a spa on site, this Corning hotel offers rooms with a flat-screen cable TV. The Corning Museum of Glass is just 2 minutes’ drive away. A coffee machine, a desk and ironing facilities are offered in each room at the Radisson Hotel Corning. Wi-Fi is available free of charge in the rooms and throughout the property. Guests of the Corning Radisson Hotel are welcome to exercise in the property’s on-site fitness centre before cooling off in the indoor pool. Meeting and laundry facilities are also provided. 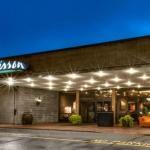 The Radisson Hotel Corning features two on-site dining options. Grill 1-2-5 serves a daily breakfast and a gourmet dinner, with options such as beef tenderloin and roast lobster. Steuben Bar is open daily and offers a variety of sandwiches, salads and steaks. The Rockwell Museum is within walking distance, 322 metres away. Benjamin Patterson Inn Museum is just 2.1 km away from Radisson Hotel Corning. The National Soaring Museum is 20 minutes’ drive away..
We plan to add more related stuff like: pet friendly hotels in Corning, New York dog friendly hotels in Corning, dog parks in Corning, pet stores in Corning, NY, and pet spas in Corning. Keep checking for more!